Greece has been in the news quite a lot over the last couple of years but the news has not been very good. 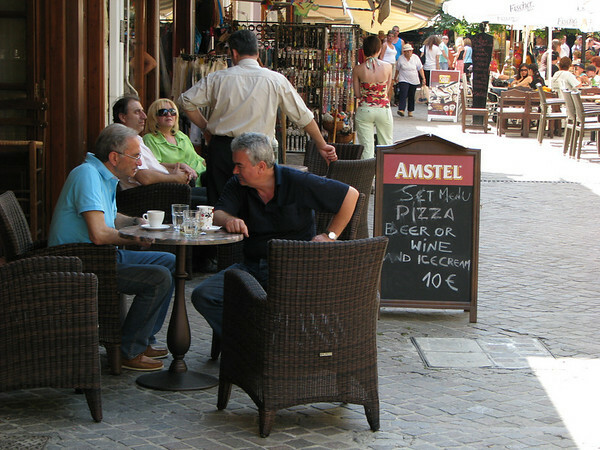 Strikes and protests in Athens around the economic crises have scared away some travelers. Consider instead a trip to the the largest of the Greek Islands, the island of Crete. Crete is definitely worth seeing and Crete holidays will take you far away from the turmoil you might find in Athens. Heraklion is a good starting point for Crete as you can reach it by high speed ferry from Athen’s port of Pireas or from the popular island of Santorini or by air. You can easily see some of the complex history of Crete in the architecture of Heraklion. A Venetian fortress (Rocca al Mare) still guards its harbor, but the city was first founded by Saracens (Muslims) who took the island from the Eastern Roman Empire. So you find buildings like the Ottoman Vezir Mosque which was built on the site of the original St Titus church and later turned back into the St Titus basilica. Crete’s history is even older than the rest of Greece. The oldest civilization in all of Europe was the Minoan civilization on Crete. Crete was the power in the eastern Mediterranean from the 27th century to the 15th century BC. It predates the Greece of Socrates (4th century BC) or even the Greece of the Trojan War (13th or 12th century BC). 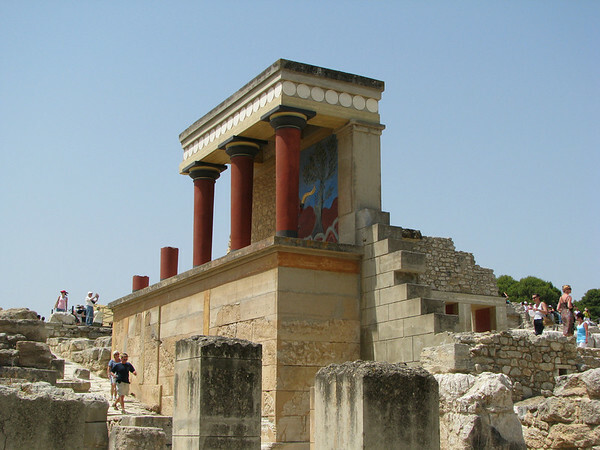 The best place to see some of the ruins of the Minoans is at Knossos outside of the city of Heraklion. In mythology, King Minos ruled from a palace at Knossos where he kept the Minotaur (half man and half bull) inside a labyrinth until it was slain by Theseus. There was a palace or at least a center of Minoan politics and culture at Knossos, but there is no evidence of a minotaur or a labyrinth. What you will find is extensive ruins and some admittedly ham fisted attempts by archeologist Arthur Evans to recreate some of the artwork, often from little original evidence. 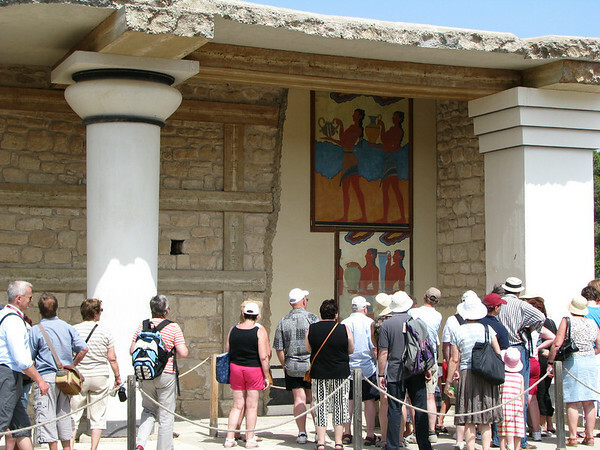 Definitely take a tour as the tour guides can help separate what is Minoan and what came from Evan’s imagination. 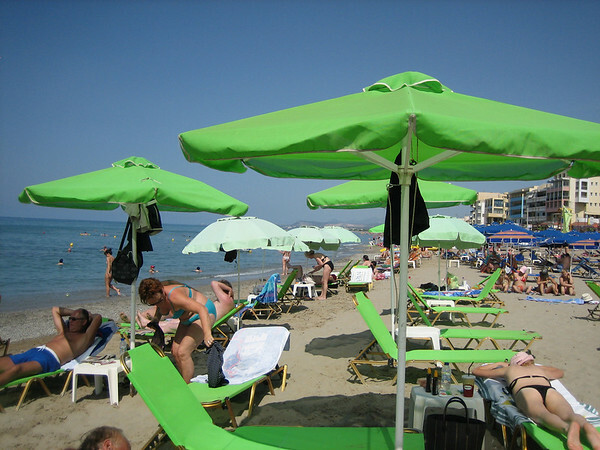 Further west from Heraklion is the beautiful beach town of Rethymno. Getting to Rethymno from Heraklion is a fairly simple drive along the national highway… or at least it would be relatively simple if so many Cretan drivers were not present. Driving on Crete (http://europe.amateurtraveler.com/2008/07/14/driving-on-crete/) has its challenges as the 2 lane highway is driven as if it had 3-4 lanes. So if you are in the slow “lane” you are really half way onto the shoulder of the road. The North shore of Crete has beaches that are better than most of the better known beaches in Europe. Forget the rocky beaches of the French Riviera or Southern Spain, Rethymno has a sandy beach and a wonderful old town with lots of shops, restaurants and bars. 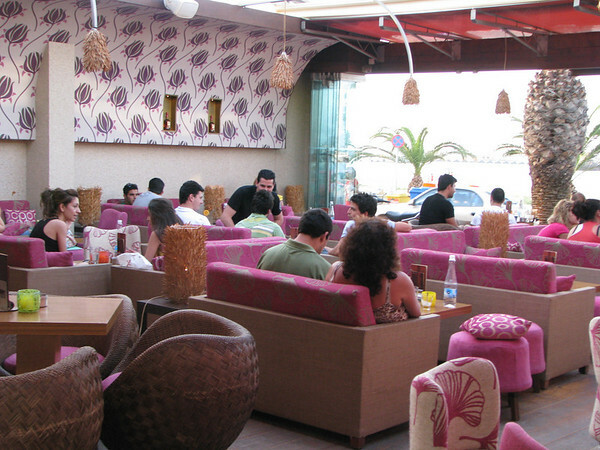 Some of the more interesting bars can be found on the border between the beach and the old city and have all outdoor seating and look more like living rooms than bars. Above the old town is the massive Fortezza on Paleokastro (“Old Castle”) hill. The fortress was built by the Venicians (well by 107,142 Cretans conscripted by the Venecians) in the 1500s after the Turks had burned Rethymno to the ground. It was conquered by the Turks a century later. A tour of the fortress is worth the hour it will take you away from the beach. The harbor in the old town is quieter during the day but then gets more energy as the sun goes down. Each restaurant has a barker (or in Greek a “kamaki” or a harpoon) that beckons you to their particularly wonderful food. Seafood is very popular but brick oven pizzas or traditional Greek fare like souvlaki or mousaka are also plentiful. Still further west on the North shore is the city of Chania which is the other natural place to enter of leave Crete as it also has an airport and fast ferry service. The colorful Central Market is a great starting point for exploring the old town of Chania. 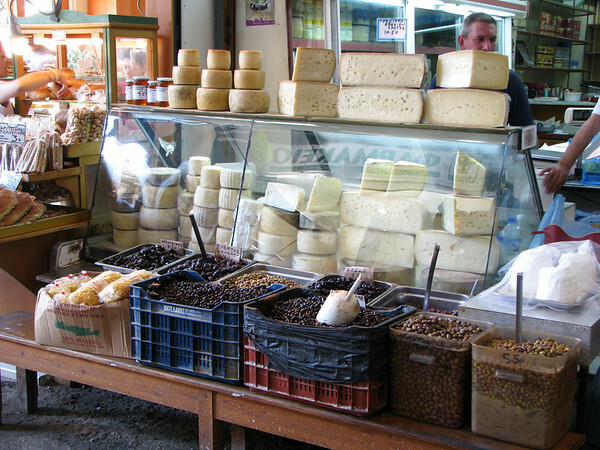 Seafood, cheese, olives, olive oil and other Greek products will provide great photographs and a pretty great picnic. Chania also has a harbor lined with small restaurants, as well as a horse drawn carriage rides, glass bottom boats and an old lighthouse. 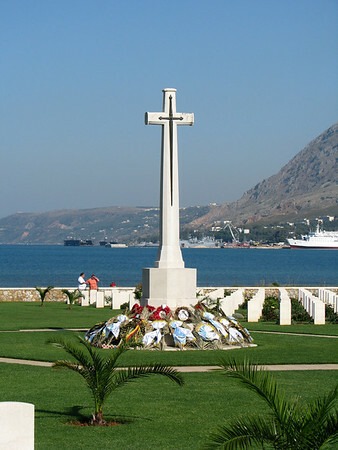 Outside of Chania there is a British cemetery dedicated to the 1,742 soldiers who were killed in the battle for Crete in World War 2. In May 1941 the skies suddenly filled with German planes as part of the first primarily airborne invasion in history. The success of the Germans on Crete led to the Allies training their own paratroopers. These days Crete spends less time warding off Saracen pirates or raiding Turks and more time entertaining tourists. The complex mixing of cultures has created a colorful, beautiful and delicious island that deserves a place on your to do list.